Let me start off by saying that being engaged is so much fun! I loved (almost) every moment from the proposal to the wedding planning to the bachelorette party to finally making it down the aisle. The one part of the wedding planning process that proved to be a difficult, albeit silly decision, was the engagement photos. My now-husband and I got engaged the eve of New Years Eve, 2016. We were so excited and overwhelmed with the new chapter of our lives just beginning. With so much to do and so many plans to make from so far away, we initially decided we were not going to do engagement photos. We got a few phenomenal photos from the actual proposal which were so beautiful, we figured that would be enough. Plus, we live in Los Angeles and our wedding photographer was all the way in Canada (where our wedding would be) and we didn’t know the next time we would return to have the opportunity to shoot with him. On top of that, we are definitely not capable of looking lovey dovey in a field at sunset where it seems most engagement shoots take place. A few months after we got engaged, I started feeling like perhaps we made the wrong decision, and in addition to the romantic proposal and the beautiful wedding to come, maybe we should document this exciting and fleeting moment in our lives of being fiances for a short while. 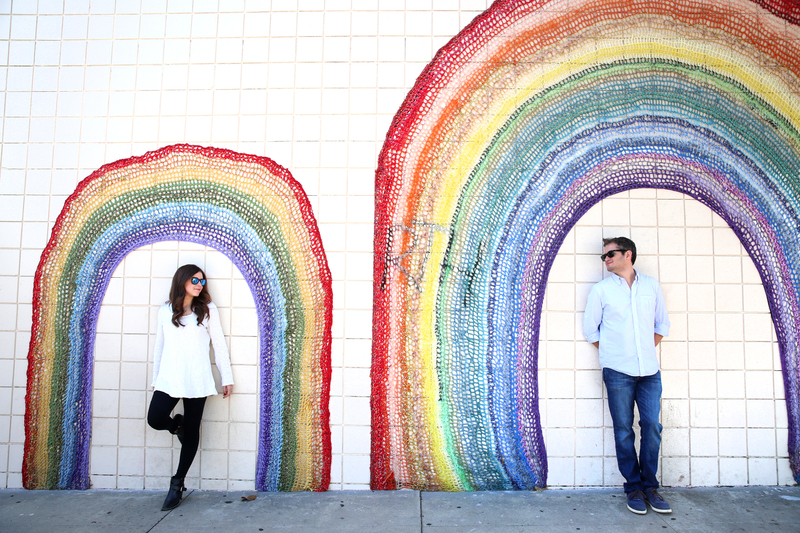 I jokingly mentioned that we should do our engagement shoot in front of the pink wall, in Los Angeles, with all the Instagram models. My fiance, Matt, retorted that we should do it at In N Out. He was serious (kinda). The joke carried on, each time adding another highly photographed location in Los Angeles: the Hollywood Sign, the Santa Monica Pier, etc, with our friends egging us on that we really should do it. When the conversation came up once again with our good friend, Blair, who also happens to be a professional and extremely talented photographer, she looked at us deadpan and said “No, you really have to do this, and I am going to shoot it and it’s going to be amazing.” At that point, we were out of excuses. When your professional photographer friend says you need to do your engagement shoot at the most basic spots in LA and it’s going to be amazing, you need do it. Just like 'La La Land'... Right? And thus, the Basic Betch Tour of LA was born. I’m glad we were finally convinced. We had so much fun running all over town to some of the most iconic spots in Los Angeles including The Hollywood sign, The Santa Monica Pier, The lights at LACMA, and The Griffith Observatory. Perhaps we were a little inspired by the movie La La Land... We even stumbled into a few beautiful corners and amazing artwork that we probably would never have discovered if not for this quirky photoshoot. Some of the photos turned out hilarious, ironic, and dorky, and some actually ended up being pretty darn adorable—quite an accurate description of me and Matt. The pink wall may have started The #BasicBetchTourLA but I’m glad we finished off these two crazy days at The Den on Sunset. Some may just see it as a dive bar with sticky floors, hot bartenders, and great music, but this is the place where we have spent too many nights out followed by so many mornings in. The place that brings all our friends together even when we vow to never go back. The place where our relationship really began. This shoot may have only lasted a couple days, but I’m excited to have these photos forever.